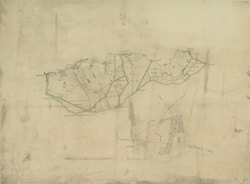 This plan is dominated by arable land divided by straight, water-filled dykes. This was a new landscape in the English fenlands. It was only in the preceding century that the Dutch engineer Vermuyden had designed the elaborate system of drains and river diversions that made possible the conversion of pasture to arable land in this region. On the top left of the manuscript, a crossed-out inscription in red ink, 'Ex AWR', reveals that the drawing was examined by Royal Military Surveyor and Draughtsman Alexander W Robe.